In this holy and blessed month of Ramadan, Google presents a gift to more than a billion Muslims all around the world by launching a YouTube channel where you can watch and listen to live Tarawih prayers, and see special programs related to Ramadan Kareem. The prayers and other programs are broadcasted live through YouTube, with good audio and video streaming quality. This is indeed a great gift to those who haven't been there, or want to listen to the Imam-e-Kaba recite the Holy Quran during Tarawih Prayers. The Channel was made live on 20th June. During the time when there are no on-going prayers, the channel shows other streams from Masjid-al-Haram and The Kaaba. The Tarawih prayers are a part of Ramadan (though not obligatory for everyone). 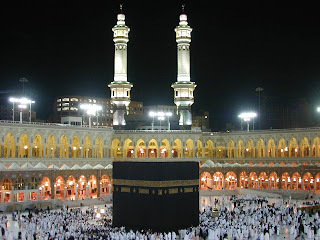 They are offered along with the usual Isha prayers (night-time prayers). They are longer than usual prayers, and it is customary for the prayer leaders to complete the Holy Quran at least once in Tarawih prayers throughout the month of Ramadan. Hence, the people offering Tarawih prayers can benefit simply by listening to The Quran. And what better way to listen to the Quran other than in the beautiful voices of Imam-e-Kaaba and Haram? Besides this live prayer stream, Google has also set up a channel for people to see live television programs from over 50 channels during the month of Ramadan. Ramadan isn't just about praying. It is about peace as well, and entertainment while learning something useful. These programs are aimed at educating people and teaching them a lesson through the use of dramas and other such programs. That is not all! Google has also organized 30 Hangouts for the 30 days of Ramadan. Since specially made Iftaar meals are traditional in Ramadan, these Hangouts will feature the best chefs sharing their recipes. Moreover, it will have doctors giving out advice about balanced diets, especially in Ramadan. Other than that, there will be literary and religious discussions as well, through which you can learn a lot! Woahoo! Such an awesome post dude! Is Qasim, Nida And Mustafa fasting for 30 days ??? This doesn't surprise me at all. I think facebook doesn't really give the user control. What I mean is your limited to what you can do. As in sharing, posting, friend requests, getting friends, etc. Some people may call some of this spam and there are those that just enjoy doing stuff like what was mentioned. They need to give this control to the user. If the user doesn't want something. There should be a little disable button. Also this 900 million. A high percentage of it is probably accounts that don't even get used anymore. They should delete some of these accounts after so many years. This supposed to be social networking. The user is the one who should be in control.